Who says kids can’t learn anything on “TV” or that too much screen time is a bad thing? There are plenty of educational, entertaining, and informative shows your kids can watch on Netflix. Wondering how you can prevent summer brain drain? I provided a list of 10 activities your kids can do this summer in that post. Just because school is out doesn’t mean the learning stops. 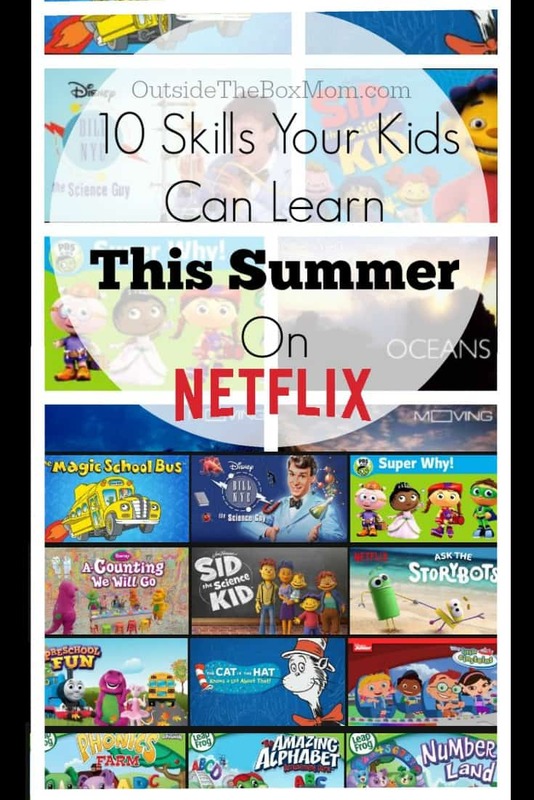 My 13-year-old son and six-year-old daughter can learn plenty of things this summer…on Netflix. No vegging on the couch playing video games all summer long. It’s important to keep reading and learning throughout the summer so you don’t lose those skills that you worked on during the school year. Summer brain drain (or the summer slide, as educators like to call it) is the learning loss that takes place for many students during summer months. It’s particularly hard on math and reading skills. Where were decimals discovered? Find out the answers in The Story of Maths. Watch all of the Math-related titles on Netflix. What’s the difference between the Earth’s surface and its inner mantle? Bill Nye, Science Guy knows the answer. Watch all of the Science-related titles on Netflix. How do alphabets make up words? Watch LeapFrog Phonics Farm, LeapFrog Letter Factory, or LeapFrog The Amazing Alphabet. Watch all of the Reading-related titles on Netflix. What are the six stages in the life of an animal? Learn the answer in Watch all of the Animal-related titles on Netflix. Which pop star is joined by many stars (including Usher, Nicki Minaj, and Ellen DeGeneres) in a documentary of his/her world tour? Find out here. Watch all of the Music & Concert Documentaries on Netflix and learn more about Art & Music here. Do you know the history of Cleopatra? Find out here. Watch all of the Documentaries available on Netflix. How did a long shot grassroots campaign turn into a historic presidential campaign? Watch By the People or another biographical documentary. The food on this Kids Menu will make your parents proud. Other food titles available, too. Learn what baking powder vs. baking soda can do to cupcakes. Watch Cupcake Wars. There are many Food & Travel titles available. Do you know what Oceans, Waterfalls, and Deserts have in common? Or, you can find some other Science & Nature titles on Netflix. Whether it’s Octonauts, Project Mc2, The Mr. Peabody & Sherman Show or Chef’s Table, Netflix shows teach our families some Trivial Pursuit-worthy stuff. You’ll be scratching your head in awe wondering how your Little Einsteins picked up these quirky tidbits — what is a symbiotic relationship anyway? Have you heard? It’s a Word Party! From the Jim Henson Company and Thirty Million Words Initiative, the new Netflix original Word Party follows Kip, Franny, Lulu and Bailey as they learn new words that will help their vocabulary grow. Word Party allows for parents to watch along with their little ones while fostering a fun and easy learning environment for everyone and encouraged to celebrate their Word Party afterwards with the whole gang. What fun facts have your kids gained from watching Netflix shows? I am a member of the Netflix #StreamTeam. I received a complimentary subscription and device. All opinions and selections are my own.